Although the festive season is associated with seeing friends and family, as well as excessive eating and alcohol consumption, it is also one of the most boring times of the year! If you belong to a family where it is traditional to spend time with in-laws, aunts, uncles, and cousins, you’ll probably need something to help you get through the ordeal. Then there is the other side of the coin. For those who don’t have family or many friends, the holiday season is a time of profound loneliness. Perhaps this is the reason why the suicide rate is higher than at any other time of year. The cold and bitter weather also doesn’t help matters as you are stuck indoors and forced to watch endless reruns of It’s a Wonderful Life. 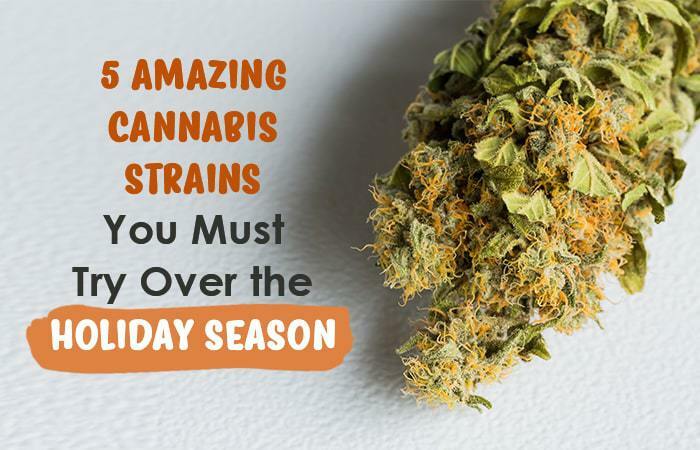 In any case, whether you need to get away from one hundred relatives or cope with the stress that only family can bring, or else you’re lonely, depressed and in need of a pick me up, we have complied five fantastic cannabis strains to help you get through the holiday season. If you need an energy boost to ensure your productivity and creativity levels don’t dwindle during the festive period, try this sativa-dominant (70%) hybrid. It was created by TGA Genetics and probably includes Space Queen genetics. With a THC content ranging from 19% to 28%, Space Jill can take your mind into the cosmos without impacting your life on Earth!